For this installment of Bump City, we talked to East Bay animator Phil Tippett. Twenty-one years ago, Steven Spielberg hired stop-motion animator Phil Tippett to create the dinosaurs in Jurassic Park. Tippett had animated the chess match and cantina scenes in the first Star Wars movie, designed the Tauntauns and Imperial Walkers in The Empire Strikes Back, and created Return of the Jedi’s Jabba the Hut. Together with Craig Hayes, he’d designed ED-209—the bad robot in RoboCop. He was a true heir of Willis O’Brien (the man who had animated King Kong) and Ray Harryhausen (whose Seventh Voyage of Sinbad had inspired Tippett to become an animator in the first place). But as Jurassic Park went into production, Spielberg changed course and decided to animate the dinosaurs using computer-generated imagery (CGI). “I’ve become extinct!” Tippett said when he saw Spielberg’s computer-generated Tyrannosaurus Rex. Famously, Spielberg gave the line to one of his actors. Tippett stayed on to supervise Jurassic Park’s team of digital animators. But Jurrasic Park opened up the CGI floodgate, and Tippett was forced to reinvent his company. 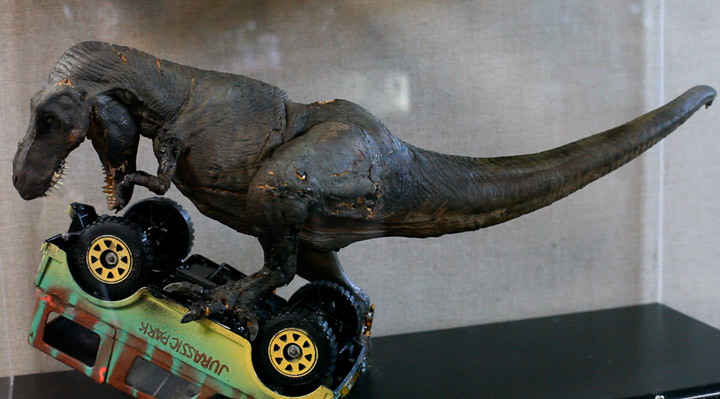 During the filming of Jurassic Park, Tippett’s team created a digital input device that allowed traditional stop-motion animators to adjust a model’s movements via computer. Here, Tippett shows us a related device, which he used to animate the bugs in Starship Troopers. Willis O’Brien and Eastern European stop-motion animator Ladislas Starevich came up with brilliant solutions to the problem of integrating stop-action models into live action sets. But even CGI animators have to anticipate the ways in which imaginary creatures might react to earth-specific gravity. When the digital revolution hit, Tippett began work on a personal film project—Mad God—which he describes as a cross between Tex Avery, Samuel Beckett, and Hieronymous Bosch. Tippett worked in stop-motion, shooting the first scenes on 35mm film. But he shelved the movie as Tippett Studio got up and running as an all-digital visual effects company. Today, Tippett Studio employs 170 people and produces computer-generated creatures and effects for films like Breaking Dawn and The Immortals. A few years ago some of the employees stumbled across Tippett’s old, 35-mm footage of Mad God. “They thought it was some Czech experimental movie,” Tippett told us. When they found out what it was, they convinced Tippett to resume work on the film. All of the sets and characters for Mad God are made by hand in a studio building a few blocks away from Tippett Studio’s main building, in West Berkeley. Tippett recycles parts from other films he’s worked on and employs a “volunteer army” of helpers. They meet every Saturday to make the movie, which they see (correctly) as a last link to thing-making ways that date back to the 19th century.